In the recent past a growing attention to the passenger is emerging overall in the transport domain. Hence, maximising the quality of travelling from the human’s point of view is a new challenge especially in those fields, such as aeronautics, in which technical efficiency, capacity and sustainability have traditionally driven the design process of systems and subsystems. In this context it is crucial to implement an efficient human centred design process in order to foresee the capability of a specific cabin interiors design of meeting the user’s expectations, including the needs related to comfort and well being. 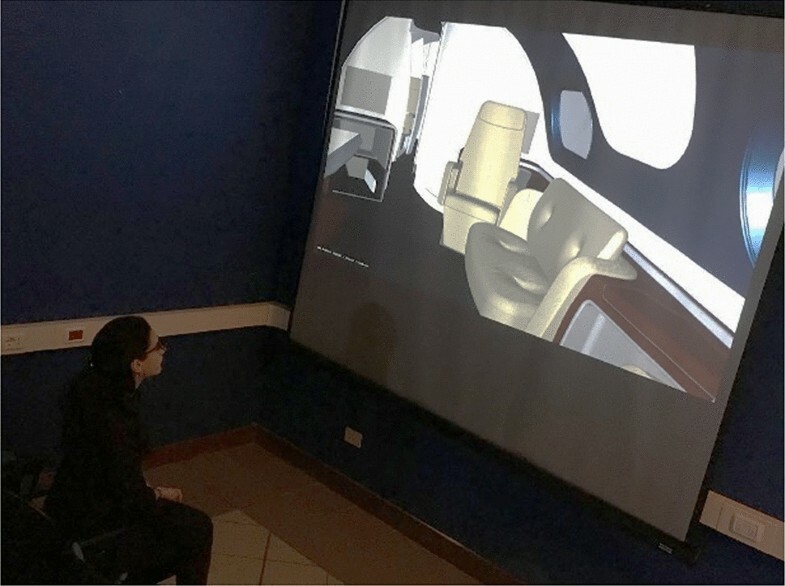 By using virtual reality technologies as a vehicle/platform, it allows the users/passengers to experience the interior environment of the cabin long before the actual development and manufacturing of the full size demonstrator. Due to the complex nature of aerospace programmes, typically taking ‘many’ years to develop and productionise, technologies which help reduce programme risk and potential delays are hugely beneficial to all partners involved. In this paper we present the results of a virtual reality based evaluation campaign specifically conceived for the collection of potential users’ feedback in the design of innovative and breakthrough solutions for the business jet industry. The main issues have regarded the identification of the expectation for such an elitist population and the creation of a Virtual Environment to explore the entire cabin as a holistic approach and innovative passenger experience. The work has been performed in the framework the Horizon 2020 project CASTLE (Cabin Systems Design Toward Passenger Well-being). Nowadays it is well recognised that, in order to guarantee an enjoyable, comfortable, and positive flying experience for passengers, designers must consider their requirements and their flight expectations in advance. The primary focus of the designers’ creative process is to maximize the user’s comfort and well-being proposing effective solutions in the layout and configuration of all the different cabin elements and geometries, colours, materials, finishes (CMF) and technological innovations. On the other hand, it’s important for the designers to understand how specific elements and features of the design can impact the well-being of passengers and their in-flight experience. This is a particularly complex journey scenario to evaluate since, there are many factors at play, besides postural and N&V factors. To compound the challenge, the target of the modelling process is a subjective variable, for example the perceived comfort of the passengers through all durations of the flight Ie. TTOL, in-flight relaxing/working, dining, sleeping, crew operations etc. In order to resolve all the current issues commonly experienced on business jets, many authors have recently worked on the concept of comfort and well-being in commercial and private aircrafts. Vink et al. present and try to find a prioritization criterion in a complete list of possible factors influencing comfort of passengers and, among all the aspects, refer also on soft aspects related to the perception of passengers, including the seat appearance, as influencing the overall wellbeing. Moreover, there are few studies that help in revealing the correlation between the physical characteristic of the cabin items and the perceived comfort. As an example, in  the authors endeavour to find the above mentioned correlation through a literature review but, due to the lack of specific literature, they have to rely on studies mainly focused on postural aspects and mostly originated in other domains, such as the automotive domain. 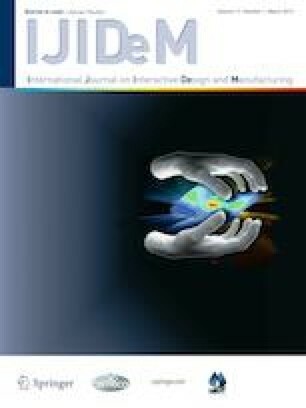 In this paper we propose to investigate the perceived well-being of passengers on board using Virtual Reality to simulate multiple different cabin scenarios at the early design stage as a contribution to the help inform and validate the design approach and concept strategy of the cabin interior that will truly deliver an innovative and ‘breakthrough’ design solution. Virtual Reality has been recognised as a valuable means to simulate interaction with product’s digital prototypes [3, 4], the majority of case studies in the previous works originate from other domains than cabin interiors design. As an example, in , authors address a novel methodology to assess the usability of a wheelchair-mounted robot manipulator. A synthetic usability index is defined, considering a multi criteria decision analysis and a scoring process for the most relevant factors. Tests have been performed in a VR environment, reducing time and costs and increasing repeatability. In , authors make use of Virtual Reality to assess accessibility and usability in ambient assisted living environment for people with disabilities. The activity has been performed in the framework of the VAALID European funded project, to quickly develop novel solutions and interfaces. In , authors make use of immersive virtual reality environments as support tools for building design and to understand end-users’ lighting preferences and performances. Overall, Virtual Reality has proven to be an effective tool for the evaluation of interfaces of consumer products or appliances , as well for ergonomic workstations  and workplaces . Finally, Berg and Vance  provide a survey on some challenging industrial applications of Virtual Reality. Authors provide an overall description of the methodological process to be followed in the Virtual Reality approach. The suggested process starts from the definition of the technologies to be used and their requirements, then a 3D model to be used in the Virtual Reality session is provided. Furthermore, an extensive study on how user experience can take advantage of the use of Virtual Reality can be found in . Despite the evidence on the suitability of using VR to evaluate affective aspects and components of comfort and the extensive number of case studies in industry, there are few references of this application of VR in the aircraft cabin interiors domain. In 2005, a survey on the use of Augmented and Virtual Reality in automotive and aerospace sectors explicitly makes a reference to the simulation of cabin interiors to achieve earlier a superior solution, even if limited to the evaluation of appearance and interaction . Moreover, a project that has investigated the potential offered by VR, particularly in the assessment of new corporate styles for seat fabrics and cabin furnishings, is mentioned in . Nevertheless, such works could not consider the advancements brought today by technological innovations in VR and AR devices, also in terms of reduced intrusiveness, such the ones brought by new generation HMDs and see-through HMDs . The work presented in this paper has been developed in the framework of CASTLE (Cabin Systems Design Toward Passenger Well-being), a project granted under the Horizon 2020 EU’s research programme in the framework of the Clean Sky initiative. Clean Sky is the largest European research programme developing innovative, cutting-edge technology for aircraft . The Clean Sky 2 initiative is structured in a number of demonstrators that cover the aeronautical industrial innovation needs for both fixed and rotary wing platforms. During the development of the CASTLE project it is foreseen to provide solutions and prototypes for the Airframe Integrated Technology Demonstrator. In this framework, special attention has been paid to the improvements that can be brought to the cabin interiors, and specifically to the in-flight experience that passengers can expect in Business Jets of the future. The main objective of the project is to conceive, develop, prototype and test cabin interiors solutions following a human centred design (HCD) approach. Therefore, the research approach is focusing on the analysis of the context of use and of the user’s requirements, on the generation of evaluation protocols for each cabin item and on the state of the art of the tools and methods for HCD . Given the innovative nature of the project, Virtual Reality has been implemented in CASTLE in order to collect data on the human perception of both the cabin environment and the satisfaction of specific requirements set in the project from the user’s point of view. In the next section the general approach of the HCD of Business Jet interiors implemented in CASTLE is described. Afterwards, in the materials and methods section information on the participants, the experimental procedure and the measurements methods are provided. Finally, the results and the discussion of results are presented. One of the main objectives of CASTLE consists in the human centred design of a novel concept for ‘Office Centred’ Business Jet interiors. 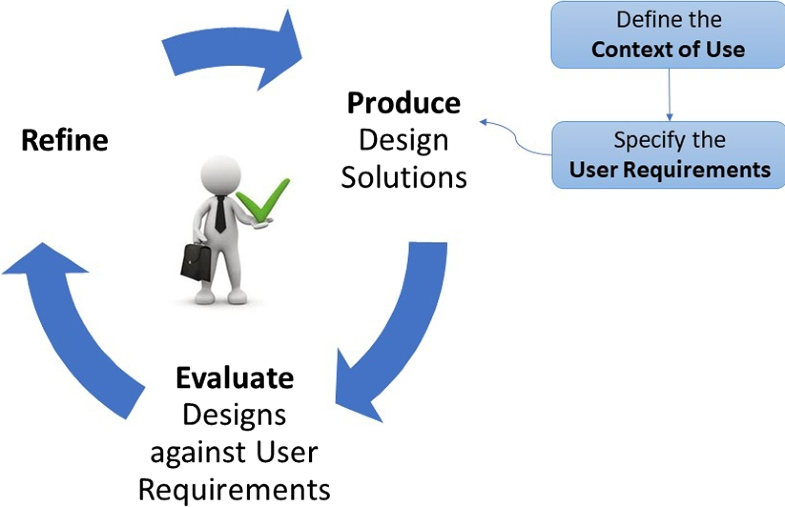 Therefore, an HCD approach has been adopted and the design flow shown in Fig. 1 has been followed by the CASTLE Consortium, that comprises eleven partners, all providing a strongly multidisciplinary R&D team, including designers, business jet manufactures, interiors manufacturers and Virtual Reality researchers. During the first part of the work the project team has been involved in several iterative review meetings. As a result, the context of use of business jet has been analysed and a list of main comfort and usability requirements has been collected in order to steer the creative process and to allow the design team to produce design solutions that are actually built upon explicit understanding of users, tasks and environments. This task has been particularly challenging since business jet users are a small percentage of flyers compared to the more widely used commercial aircraft ‘landscape’, moreover the requirements are very much varying among business jet customers. Nevertheless, the airframe manufacturer provided the design team with extensive knowledge, experience and background to help inform and define the context of use and the main issues observed in currently available business cabin interiors and aircraft. In addition, special attention has also been paid to the research of novel trends and technologies to be included in the study. Since many different concepts have been generated, a concept screening phase has been conducted and a main modular concept has been selected for further evaluation. As shown in Fig. 2, in this modular layout the cabin is divided into five zones and for each zone different functional requirements have been defined. Flex Zone A is a flexible area for informal and formal activities. Whereas Flex Zone B has been conceived primarily for more private activities and functions, such as individual work spaces, relaxing pods and private beds. Two Lavatories are positioned conveniently for both passengers and crew to use easily, intuitively and safely. Finally, the Galley and Crew rest area is located in forward of the main entrance passenger door so that, on entry the passengers are not entering into the crews working galley but also during flight, there is an improved separation between the galley and main passenger areas, therefore reducing passengers in-flight disturbance. At this stage, the design solution is available as a conceptual model, only including surface models and material finishing definition. Having in mind this kind of input, several tools and methods have been proposed for the evaluation of early design solutions against user requirements, ranging from Human in the loop simulations to Virtual Manikins and aiming at collecting both subjective and objective measures of different components of comfort, such as visual comfort, interaction comfort, postural comfort and living space comfort. The experiment described in the following section concerns the subjective measures of comfort collected during human in the loop simulations where the subjects have been asked to provide their feedback through self reported questionnaires once experienced the cabin in a Virtual Reality set up. The proposed validation process mainly refers to the visual component of comfort perceived by potential passengers and to the quality of the perceived interaction between the human and the cabin environment. The 3D surface model of the cabin has been provided by ACUMEN and has been processed by UNIBO through IC.IDO Software to create the experimental virtual scenario. IC.IDO.® is a 3D immersive VR software, provided by ESI® Group, supporting industrial decision making processes and digital mock-up verifications. Two different CMF (Color Material Finishing) options, referred to as “schemes”, of the same cabin model are considered for the visual assessment of the modular lay-out in a comparative evaluation process. Thus, the virtual model has been completed with the materials and textures information indicated by the design team (Fig. 3). Figure 4 shows the textured mock ups and the differences between the two schemes, hereafter indicated as Scheme 1 and Scheme 2. Two Virtual Reality systems have been set up for the CASTLE Business Jet model at the Virtual Reality Laboratory of the University of Bologna located in Forlì, namely the Passive Stereo Theatre and the Microsoft™ Hololens™. The Passive Stereo Theatre is a multiuser virtual environment based on a passive stereo screen arranged in a small theatre-like layout. This facility is normally used for collaborative design reviews, while in CASTLE it is used to introduce the participants to the Business Jet virtual scenario allowing them to familiarize with it before wearing the Microsoft™ Hololens™ and entering the virtual cabin (Fig. 5). As anticipated above, the Head Mounted Display used in this experiment is Microsoft™ Hololens™, the optical see-through head mounted display developed and manufactured by Microsoft™. This device is implemented in the CASTLE experiments for the subjective assessment of the visual comfort perceived by a single passenger that moves around—without constraints—in the cabin. The Microsoft Hololens is a wireless device and, although not being completely immersive, it allows participants to walk in the cabin covering the same walking distance that a user would cover in a real cabin. The set up takes advantage of the possibility to actually walk for the entire length of the fuselage stepping from one section of the cabin to another, for example from the lounge into the galley, with the same walking proportion that the passenger would experience in a real cabin. Furthermore, while wearing the device, the see-through features enables the user to partially see his/her arms and his/her hands and to navigate the 3D model in a sort of Mixed Reality  configuration where the real component is the user’s body. This allows to simulate the interaction with objects as the distance to computer generated parts of the cabin is perceived with an high degree of realism. For example the user can try to touch objects, moving his hands to reach surfaces as if these were real. Figure 6 depicts the device used, the synthetic image proposed, and an example of user involved in the experimental evaluation procedure. The experimental procedure is depicted in Table 1. Firstly, the user is welcome and informed about the anonymity of the test, its duration and the organization of the experiment. Secondly, the subject is asked to sign the informed consent form before starting the test. 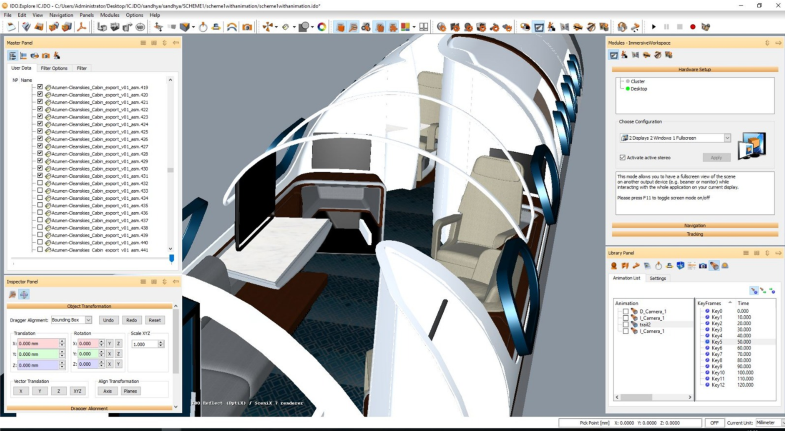 Then, a preliminary briefing on Passive Stereo Theatre introduces the user to the virtual scenario and gives an overview of the modular concept, the general model layout and the features of the Business Jet cabin interiors. Here the textured 3D surface model of the cabin interiors is projected onto the screen and the user, wearing stereoscopic polarized glasses, experiences an animation of the cabin to familiarize with the different zones and modular layout along the fuselage. After these preliminary steps the subject is invited to wear Hololens and to walk along a corridor. While he/she moves along the aisle and looks around, the HMD projects the model and gives the illusion of actually being inside the luxury aircraft. Finally, the subject is asked to fill in a questionnaire. The total duration of the experiment is 30’. On the whole, 40 voluntary subjects, mainly recruited among University students, took part to the experiments divided into two groups, one for each of the two colours and materials combinations (schemes) that have been tested. 21 persons were involved in the assessment of Scheme 1, while 19 persons were involved in the assessment of Scheme 2. All participants were asked to sign the informed consent before the test. The average age of participants was 23 in the first group and 20 in the second group. The entire sample was mostly male (81% male for Scheme 1 and 94.7% male for Scheme 2). Finally, 42% of the participants to Scheme 1 experiment had a significant flight experience, in contrast with the participants of the second group, in which only 10.5% had flied more than 10 times (Table 2). The questionnaire submitted after the test considers aspects of perceived visual comfort, functionality and aesthetic appearance and it is divided into six sections, one for the General Design, one for the Flex Zone A, one for the Flex zone B, one for the Central Lavatory, one for the Galley and Crew rest area and finally a question about the VR Experience liking. The questionnaire has been built upon a scale rating approach and is mainly based on Likert five-points scales [20, 21]. In the General Design section participants have been asked to rate their perception of being in a homely environment and of being in a luxury environment. About the Flex Zone A the testers were asked to evaluate if entering the cabin they feel they are guided directly to the Conference and Lounge Zone without having a sight of the galley. Moreover, the functional usability of the Zone has been evaluated through rating scales on the suitability of the design against different activities to be performed in the zone as dining, relaxing, working and socializing. In the Flex Zone B section, the questionnaire focuses on rating the perceived sense of privacy and the perceived suitability of the zone for activities such as working, dining and or relaxing. In the Central Lavatory section, the questionnaire aims at collecting data on the perceived sense of accessibility and of the perceived living space. Also, the aesthetic appearance has been rated as the level of appreciation of the general style of the central lavatory. Finally, in the Galley and Crew rest area participants have been asked to rate how they do perceive the accessibility to the storage area and to the crew rest area. 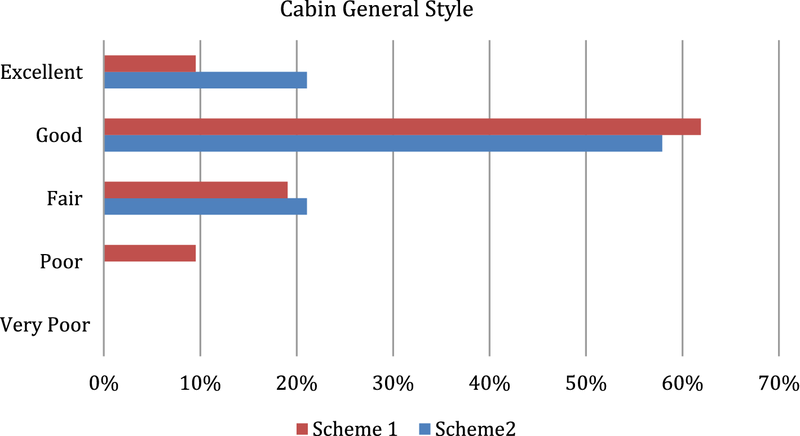 The general design of the cabin has been rated positively in both Scheme 1 and Scheme 2. In Scheme 1 more than 70% of participants rated as good or excellent the general style of the cabin in terms of material and colour, 19% rated it as fair and 9.5% rated it as poor. In Scheme 2 this percentage of participants that rated the general style as good or excellent is slightly under 80%. In Scheme 2 it is noticeable that more than 20% of participant rated it as excellent and that none rated the style as poor or very poor (Fig. 7). More than 73% of participants to the Scheme 2 experiment agree on the fact that the cabin environment with this CMF gives a homely feel. This percentage is lower in Scheme 1 experiment, being 61.9% (Fig. 8). 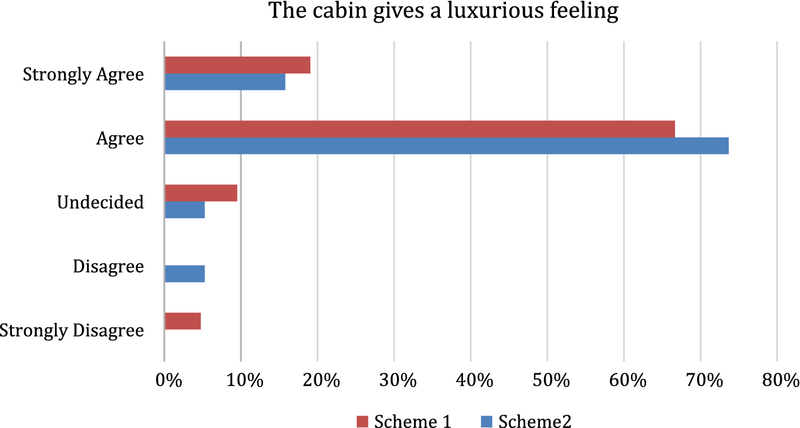 More than three out of four participants agree or strongly agree with the accomplishment of the luxury feel requirement in Scheme 1 and almost all the participants to the Scheme 2 Experiment (Fig. 9). In the Flex Zone A section of the questionnaire the users were asked to evaluate if entering the cabin they feel to be guided directly to the Conference and Lounge Zone without having a sight of the galley. Both in Scheme 1 and Scheme 2 experiments the participants confirmed that they are actually guided to the Conference and Lounge Zone, except a negligible percentage of disagreement in Scheme 1 (Fig. 10). This area was judged suitable for dining, for relaxing, for working and socializing with different levels of agreement (Fig. 11). According to the data, the most suitable function is socializing, especially in Scheme 1. The Flex Zone A, Conference + Lounge, in terms of privacy, has been rated as good or excellent by almost 50% of participants in Scheme 2 and good by 24% of participants in Scheme 1 (Fig. 12). About the Flex Zone B, the majority of users judged it suitable for dining, relaxing and working (Fig. 13). 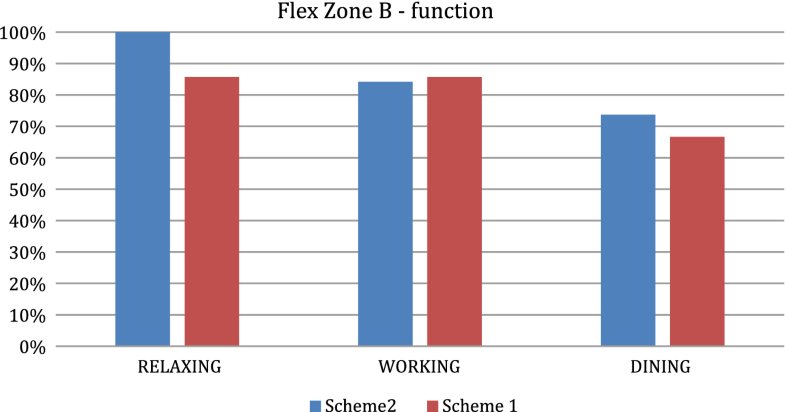 The rating of Flex Zone B, in terms of privacy, convinced all the users in both configuration with a higher than 50% percentage of excellent in Scheme 2 (Fig. 14). Central lavatory accessibility and internal space visual perception has been rated as good by 42.9% of the users and excellent by 14.3% of them in Scheme 1 and good by 52.6% of the users and excellent by 10.5% of them in Scheme 2. 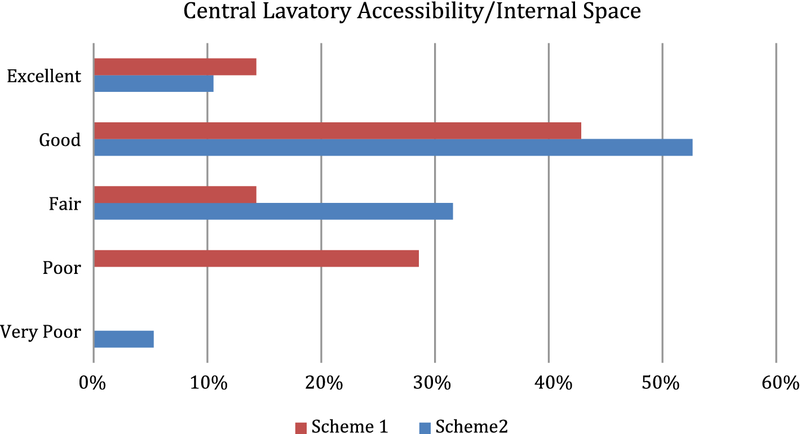 Nevertheless 28.6% of participants in Scheme 1 rated as poor the perceived accessibility and internal space (Fig. 15). 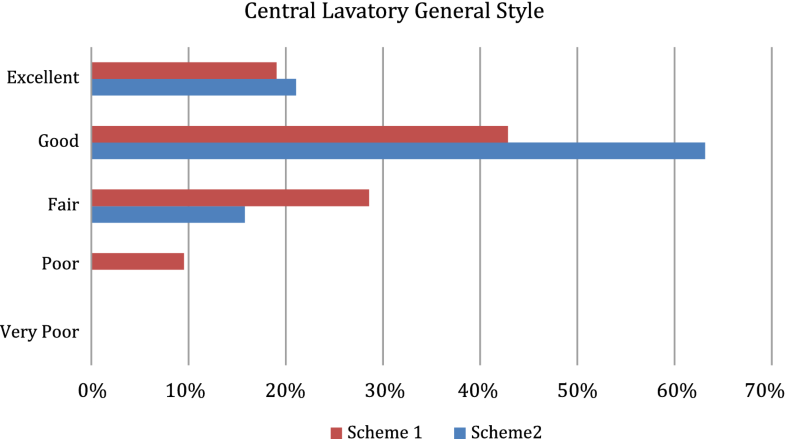 The general style has been rated positively in both Schemes but in Scheme 2 the percentage of those who rated the central lavatory style good or excellent is over 80%, while in Scheme 1 is around 60% (Fig. 16). 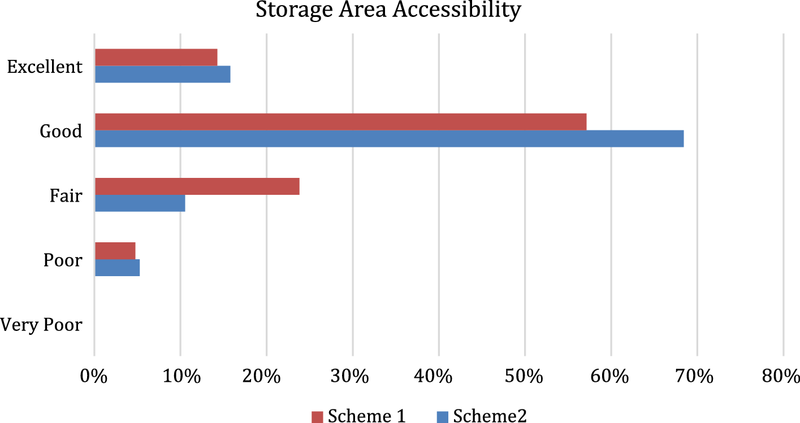 The perceived accessibility to the storage area in the galley in Scheme 1 has been rated as good by 57.1% and excellent by 14.3% of participants. In Scheme 2 these percentages result respectively 68.4 and 15.8 (Fig. 17). The perceived accessibility to the crew rest area in Scheme 2 has been rated as good by 42.9% of participants and excellent by 23.8%. In Scheme 2, these percentages result 63.2 and around 10% (Fig. 18). Finally, 100% of the users enjoyed, in general, the VR Experience. Even if the modular layout has overall been rated positively during these preliminary tests, slight differences in ratings between the two schemes have been identified that can help to refine the design with a better awareness of the strengths and weaknesses of the business jet solution initially proposed. Specifically, in the General Design section both the schemes have been appreciated even if the style of Scheme 2 is rated as either excellent, good or fair by the totality of participants and also the percentage of participants that report to perceive a homely feeling is higher in this test compared to the Scheme 1 test. Finally, both the configurations are perceived as luxury environments. Therefore, we can affirm that both design solutions generally meet the aesthetic, homely and luxury feeling requirements but the Scheme 2 has a greater positive impact on these aspects. 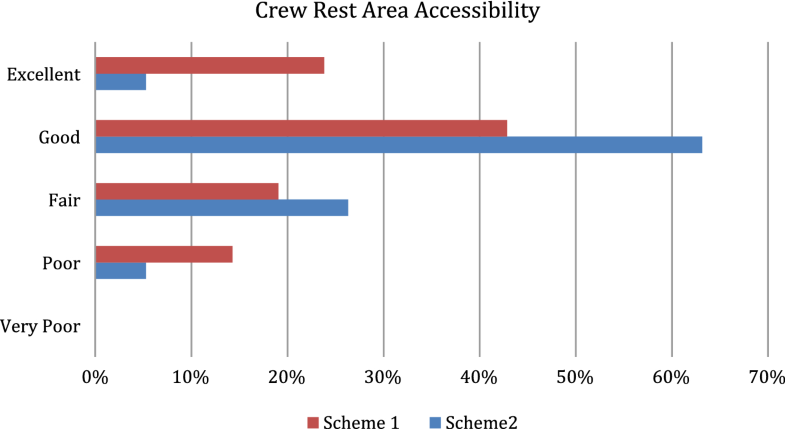 As expected, the Flex Zone A is not perceived as a private space by the totality of participants, even if Scheme 1 seems to induce the passenger to feel in a private space more than Scheme 2. In general, the zone is perceived as a multifunctional space. On the other hand, the FLEX ZONE B, based on the private pods, inspires privacy and is perceived as a good place for relaxing or working by the totality or almost the majority of participants. An interesting difference between the two configurations emerges from the question concerning the perceived accessibility and internal space of the lavatory. This is a narrow space and the geometry combined with the right CMF is expected to help the passenger feel comfortable even moving in a very small environment. Since almost 30% of participants in Scheme 1 reported to perceive the aspect of the accessibility and living space of the central lavatory as poor, it is reasonable to think that the combination of colours and material in Scheme 2 for the lavatory works better in giving the illusion to be in a larger space. Nevertheless, additional tests are recommended to further investigate this aspect. Moreover, in Scheme 2 the general style of the lavatory is more appreciated than in Scheme 1. As far as the Galley is concerned, a main aspect that has been considered in the questionnaire is the accessibility to the storage area drawers and the perception of reaching with both hands the material stored on shelves and in drawers. This is a totally new design and no physical reference exists to understand how comfortable a member of the crew could feel operating in this galley. In this case the level of realism provided by the simulation is considerably high since the stereoscopic vision replicates the objects at the real distance and with the real dimension. Moreover, using hands, one can simulate the real movements to reach the single components of the scene, such as glasses and dishes included in the scenario. Overall the accessibility to the storage area has been rated positively and this confirms that the design proposed by Acumen should be furtherly refined. As expected the Crew Rest area, although being generally rated positively, got some negative feedbacks in Scheme 2. 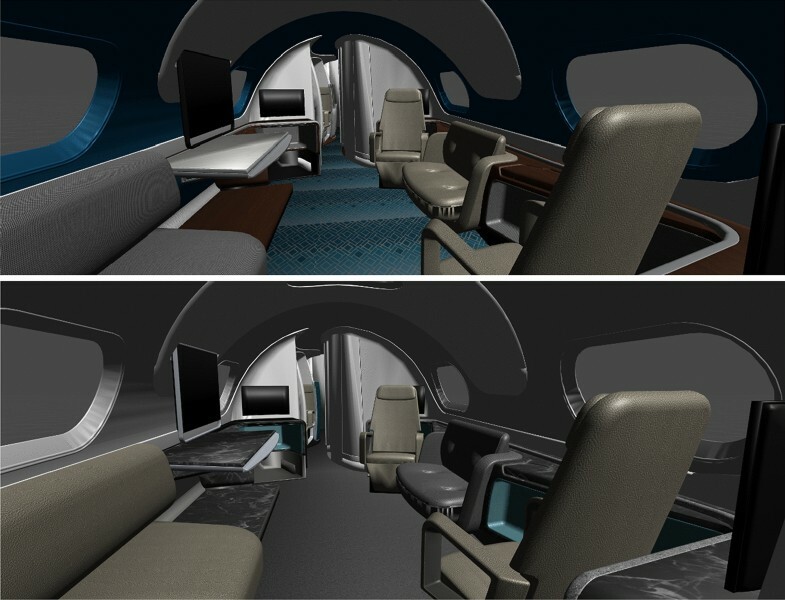 In the framework the CASTLE Business Jet evaluation, comfort design is associated to the evaluation of alternative design solutions in the earliest design stages: mock-ups are implemented in Virtual/Augmented Reality environments, and methods to capture user’s perception are considered in terms of emotional feelings inspired by the different proposals. Human in the loop assessment approach is implemented to evaluate user comfort, provided by the emotional feeling arose within the virtual experience. Preliminary feedback has been provided for the down-selected proposed conceptual design solution well in advance of any full-size mock-ups being manufactured. It is worthwhile reiterating that this early VR validation process is a crucial exericise in order to save time, cost, and market risk of the product/interior. A specific challenge of walking in a fuselage has been incorporated in the VR with a two step approach: familiarization + untethered walk through. The advantages of using a stereoscopic see through device for Virtual Reality have been highlighted and they can be summarized as: (i) no simulation sickness, (ii) irrelevant limited field of view for the user, (iii) enhanced proprioception (mainly due to the fact that the user can perceive his/her arms/hands even if faded by the projection without latency or unreal perception typical of avatar hands). This latter findings make this work a starting point for further use of Virtual Reality/Augmented Reality/Mixed Reality technologies in the design and development process of large and complex products and can really strengthen the competitiveness of industries not only in the aeronautics domain. The work presented in this paper has received funding from the Clean Sky 2 Joint Undertaking under the European Union’s Horizon 2020 research and innovation programme under grant agreement No 807083”. Authors Acknowledge the volunteers who took part in the experimental campaign. A special acknowledgement to Sergio Piastra and Sandhya Santhosh for the technical support provided during the test.